This entry was posted in Forestry, From The Field, Wildfire and tagged Shasta Trinity National Forest, wildfire by foresterartist. Bookmark the permalink. Tim will the trees be felled? I’m not sure about this species, I’m assuming that they don’t regenerate like most eucalypts. Spring in Oz and an El Nino with a big fire season forecast here too. They should be, but the way our National Forests are currently being managed, I doubt it. Unfortunately, when they don’t harvest the dead trees they don’t replant the site. Most of the trees are Douglas-fir and don’t stump sprout like eucalyptus. Thanks for sharing. What can be done, Tim? Are there grants available to help with National Park management when resources are low? These fires burned on the National Forests. There is a huge difference in management objectives between the National Forests and the National Parks. The NF are supposed to actively manage these forests. The NP have a “let nature take its course” approach. However, in recent years the FS as gone away from their multiple use ethic. It isn’t an issue of grant. They used to manage NF at a profit, because they contain a valuable resource. They could again, while accomplishing important management goals. Unfortunately, politics has interfered with proper forest management. This fire was in Trinity County, and it’s estimated that the Lightning fires burned 10% of the county this summer. Oh dear; I am so incredibly sorry to hear this, Tim. It is sad Teresa. These are your forests. These kinds if fires can’t be eliminated, but this level of magnitude can been reduced through proper forest management and fuels reduction. It’s one unfortunate aspect of living in the western US. The wildfires are as inescapable as tornados in the Midwest. It’s a shame that this is not being managed properly. What happens when the forests aren’t replanted. I don’t think any of the politicians have the vaguest idea of what to do and just sway with the public breeze instead of trying to understand what is going on. I think you’re right about the politicians Ruth. Without replanting, they depend on natural seeding in. 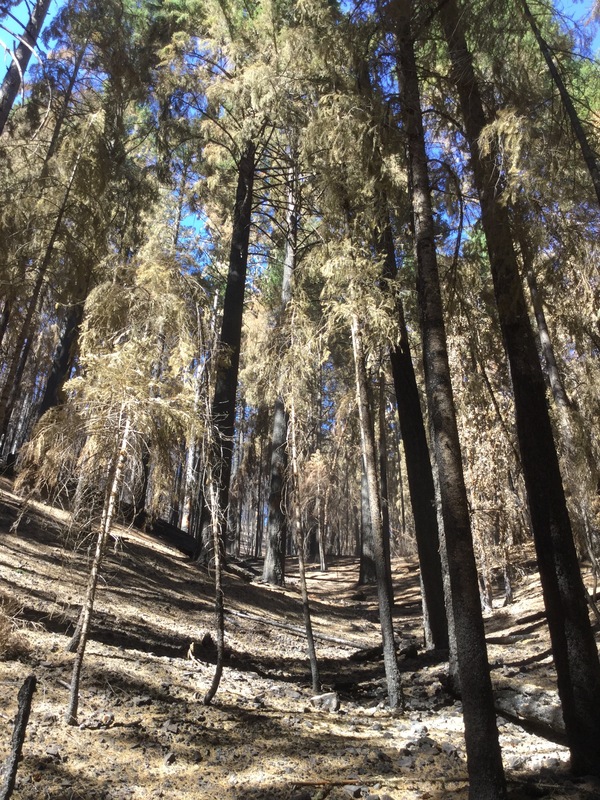 When the fire burns hot, as with a crown fire, the cones are destroyed and there won’t be much seed available. If the crowns don’t burn, then cones can still release the seed even if the tree is dead. Also, trees don’t produce cones every year, so if there is no cone crop, then there is no seed. if the fire burns early July or before the seed won’t be viable, because it isn’t ripe. Lots of variables affect natural regeneration. The other issue that arises after a fire is the germination of brush competition. Fires often cause brush seeds to germinate. Many brush species can have viable seed in the soil for decades just waiting for a fire. Heavy brush competition can choke out the young trees. Controlling the brush is important too. The good news is that much of the area burned in the fires, burned at a lower intensity. Hopefully, there will be a good amount of natural seed.